The famous watchmaker Ivan Arpa, whose work does not cease to amaze watch lovers of the unusual and non-traditional watchmaking performance, along with his wife Dominique Arpa Tsirpka, who is a talented artist to create his watch creations draws inspiration from everything around you. Another was the brainchild of a talented master new model Son of Earth, which was presented at the annual GTE 2013. When you create a new model of Son of Earth Ivan Arpa and Dominique Arpa Tsirpka used various natural pigments from many exotic places in the world, such as Egypt, Australia, Italy, South of France, etc. Most of these pigments – organic: it’s minerals, animal remains, shells, etc. It is these pigments, long before Ivan Arpa emperors used artists, describing their chambers and tombs. One of the most common and rare pigments, which come down to us from ancient time, is Murex, as for only 1 gram of this unique pigment to about a hundred small shells, which serves as a sink for pigment murex. Blue pigment used by Ivan Arpa in their hours, comes from the plant, which grows only in Egypt. 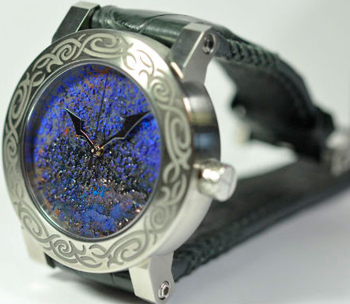 Rare pigments and sophisticated turn all watch Artya in most works of art. New watch Son of Earth (Son of Earth), the name that fully reflects their meaning, were presented at the exhibition GTE 2013.